Soak Up the Sun, Snorkel, & Enjoy the Views of the Pacific Ocean. The Ocean King Catamaran boat trip is a wonderful way to spend a few hours out at sea enjoying the beautiful Pacific Ocean, soaking up the sun, and snorkeling in the crystal waters. This is a perfect excursion for families, couples, and friends looking for some adventurous fun out at sea! You will be picked up from your hotel and driven down to the Pez Vela Marine in Quepos, a 20-minute drive away from most hotels in the Manuel Antonio area. Here, you will board the Ocean King Catamaran, a 100-foot-long boat with two floors offering ample room for you to find your own private space for you and your group! On board you will find two Jacuzzis (each one fits up to eight people), two giant trampolines, two slides, and a large bar area. Enjoy the live music as you glide through the Pacific Ocean. Spend some time snorkeling and spotting the tropical fish, sunbathe on the deck, and enjoy the boat’s wonderful amenities. The crew on board are lovely and will come around offering you drinks and snacks. Enjoy a wonderful buffet lunch or dinner of a range of salads, rice, vegetables, meat, and fish (vegetarian options are also available). 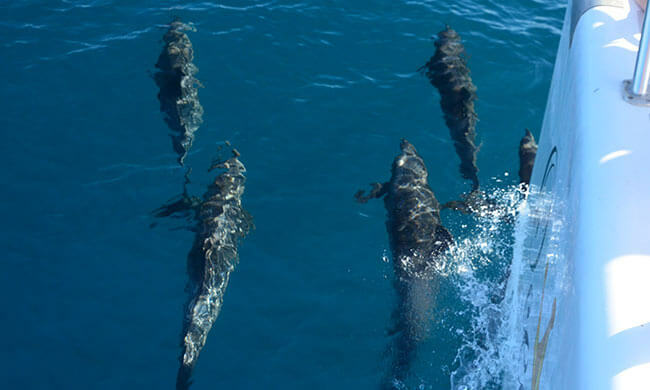 Look out for the dolphins and enjoy the stunning views of Manuel Antonio National Park from the ocean. Your tour includes: Drinks, cocktails, lunch or dinner, fruits, snacks, snorkeling gear. What to bring: Swimming suit, towel, sandals, sunblock, sun glasses, camera, hat.